Another Double-Digit Dividend Hike From McDonald's This Year? MCD is the only restaurant chain that has raised its dividend for 43 consecutive years. The company raised its dividend by 15% last year and will announce its next dividend hike in September. MCD expects to grow its sales at a 3%-5% annual rate and its earnings per share at a high-single digit rate in the long run. McDonald’s (MCD) has raised its dividend for 43 consecutive years and hence it is a dividend aristocrat. It is the only restaurant chain with such a long dividend growth streak. In addition, it raised its dividend by 15% last year. Therefore, as most of its shareholders are holding the stock for its dividend, the big question is whether they will receive another double-digit dividend hike this year. The exceptional multi-decade earnings growth record of McDonald’s was temporarily interrupted in 2012-2014, during the tenure of Don Thompson in the CEO position. The company faced heated competition from other restaurant chains in its business while the company was also affected by the increased health consciousness of consumers. The previous CEO failed to navigate through the challenging business landscape. However, since the current CEO, Steve Easterbrook, took the helm, in 2015, McDonald’s has returned to its growth trajectory thanks to a series of successful strategic initiatives. The company began to offer all-day breakfast, which provided a great boost to its same-store sales. Moreover, it enriched its menu with some healthy options, such as organic meat. Furthermore, McDonald’s spent hefty amounts on remodeling its stores. That was a great strategic move, as most of the stores looked old-fashioned and unappealing to the consumers who have a reasonable minimum standard in their dining experience. Wendy’s and Domino’s have been running similar initiatives in recent years. The remodeling of the stores of McDonald’s has been a great success, as the remodeled stores have grown their same-store sales by at least 3% per year for four consecutive years. In the latest quarter, McDonald’s exhibited remarkably strong performance. It grew its same-store sales by 4.4%, more than the 4.0% rate expected by the analysts. Its comparable sales rose 2.3% in the U.S., which is a relatively mature market, and 4.8% in the high-growth markets of the company, led by strong results in Italy and Netherlands. The company achieved same-store sales growth for a 14th consecutive quarter. It also achieved two consecutive years of global guest count growth for the first time since 2012. It is also worth noting that McDonald’s has exceeded the analysts’ earnings-per-share estimates in 14 out of the last 15 quarters. This is a testament to the impressive business momentum of the restaurant chain. McDonald’s has refranchised thousands of its stores in the last four years. Consequently, its sales have decreased 23% during this period, from $27.4 B in 2014 to $21.0 B in 2018. However, this move has greatly benefited the shareholders, as the company has grown its earnings per share by 73% over this period. Thanks to this initiative, the company became much leaner, with much lower operating costs. To be sure, its operating margin has expanded from 29.0% in 2014 to 40.8% now. Thanks to its efficient business model, the company has been able to increase its leverage and reward its shareholders via aggressive share repurchases. Its share count has decreased 20% in the last four years. However, although the shareholders have benefited from the above strategy, it seems that this strategy has run most of its course. The net debt of the company (as per Buffett, net debt = total liabilities – cash – receivables) has almost doubled, from $18.1 B in 2014 to $35.8 B now. Although this amount is only 6 times the annual earnings and hence it is easily manageable, the company is not likely to add much more debt to fund aggressive share repurchases. Therefore, investors should not expect much growth of the bottom line from further leverage of the balance sheet. On the other hand, they should expect the company to continue growing its earnings thanks to the sustained momentum of its remodeled stores and the continuous improvement of the menu offerings. Management recently stated that it expects to grow sales at a 3%-5% annual rate and the earnings per share at a high-single digit rate in the long run. This is certainly an impressive long-term growth rate for a relatively mature company that has grown for decades. As mentioned above, McDonald’s is a dividend aristocrat, with an exceptional dividend growth record. It is the only restaurant chain that has managed to raise its dividend for 43 consecutive years. Moreover, the company is expected to announce its next dividend hike in September. Between 2012 and 2016, McDonald’s raised its dividend by just 5.1% per year on average, mostly due to the aforementioned challenges it faced in its business. However, the company has raised its dividend at an 8.1% average annual rate in the last decade. Even better, it raised its dividend by 15% last year. Moreover, despite the impressive dividend hike, the payout ratio is still a healthy 59% while net debt is only 6 times the annual earnings. Therefore, the company can easily offer another double-digit dividend hike to its shareholders this year. 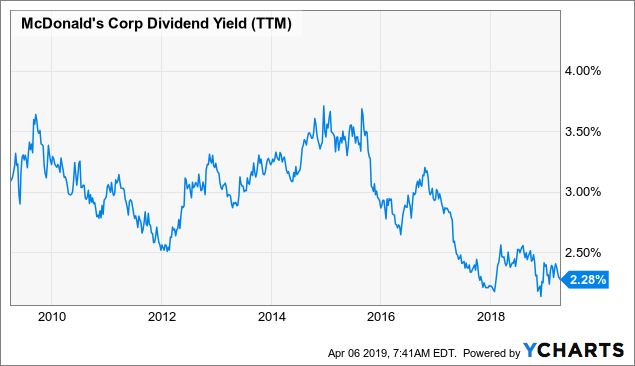 It is also worth noting that the current 2.4% dividend yield is below the historical average of the stock, which is slightly above 3.0%. The low current yield has resulted from the 46% rally of the stock in the last two years. Overall, McDonald’s is likely to announce another double-digit dividend hike this year. As I expect the dividend hike to be slightly less than the one of last year, I expect the company to raise its dividend by 12% this year, from $1.16 to $1.30. In such a case, the stock will be offering a 2.7% dividend yield from September at the current stock price. As the ongoing bull market has become the longest in history and a recession has not shown up for a whole decade, it is critical for investors to check the resilience of their stocks to a potential recession. McDonald’s is a remarkably resilient stock. Thanks to its affordable menu offerings, its results remain strong even under the most adverse economic conditions. To be sure, in the Great Recession, when most companies saw their earnings collapse, McDonald’s kept growing its earnings per share, by 26% in 2008 and by 8% in 2009. The strong business performance of McDonald’s was clearly reflected in the behavior of its stock price. While S&P plunged 55% during the Great Recession, McDonald’s incurred just a mild 12% correction. In other words, its shareholders hardly felt the impact of the Great Recession. Whenever the next recession shows up, the stock is likely to outperform the broad market by a wide margin once again. Therefore, income-oriented investors should not be concerned over the safety of the dividend of the company in the event of a downturn. On the other hand, it is prudent not to expect the above stellar performance to be repeated, as that performance was exceptional. After a short period of stagnation, McDonald’s has returned to its solid long-term growth trajectory in recent years. The company expects to grow its sales at a 3%-5% annual rate and its earnings per share at a high-single digit rate in the long run. Given the strong business momentum, the healthy payout ratio, the manageable amount of debt and the resilience of McDonald’s to recessions, management is likely to announce another double-digit dividend hike this year, most likely a 12% raise, from $1.16 to $1.30. Such a dividend hike should satisfy even the most demanding shareholders, particularly given the relentless rally of the stock in the last two years.